Home > Mothers Professional Wheel Cleaner 128 oz. Free Bottle with Sprayer! 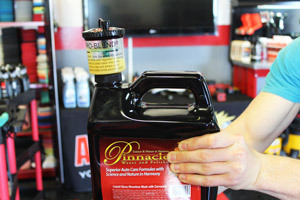 > Pro Blend Bottle Proportioner 128 oz. Unfortunately I bought this as an add on when I bought a gallon of soap. If I had read this first, I would not have bought it. Anything over the viscosity of water will not work with this. I'm sure it will work great for very thin liquids. It works really well for liquids. I have not tried it on viscous chemicals. It definitely saves me time and money. I can get very precise over how much chemical I am using. Seriously, you only have to squeeze the container to fill it up. It is not that hard and I have no problems with it. If you like to see a real magic, buy this worthless thing. It will waste your money, time, and nerves at the same time in a very short period of time. It may be good to measure alcohol or water which have very low viscosity, but for sure it won't work on your car wash soap container. The people having issues with this are expecting it to be far too accurate. I squeeze the bottle and let the the excess flow back into bottle. Then I pour it out measured amount quickly. If you take your sweet time pouring you might get another half oz out. If you need accuracy down to the ml or cc then get a syringe. How did others expect it to fill the measuring cup if it didn't have a hole to the bottles contents? ProsWorks great and helps me meter product. 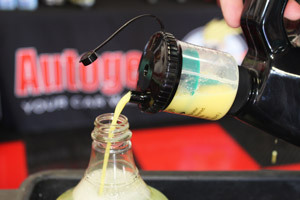 ConsA little excess can leak out if your not to careful when pouring . Inaccurate, waste of money. You have to squeeze the life out of a gallon size jug to fill the ratio then it doesnt poor out. Absolute Waste.